How is this different from you meta data taxonomy filter plugin? And is that plugin still being updated? Or is this the NEW improved version? What is the difference between this version and the Lite version? MDTF and WOOF – 2 different filter plugins. 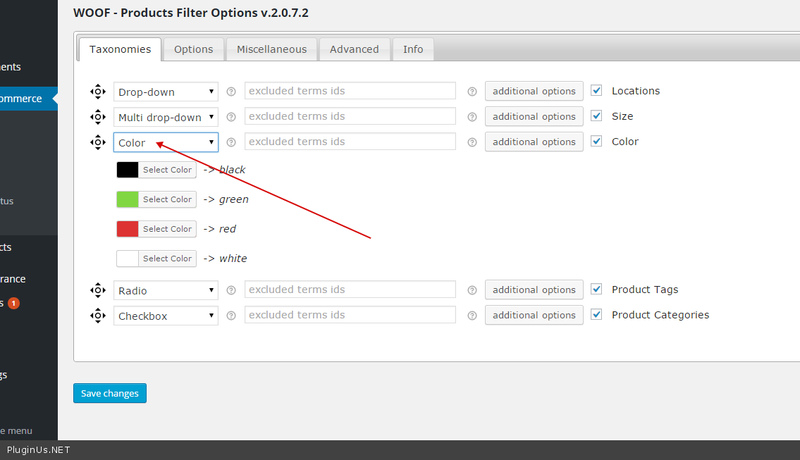 WOOF can only filter woocommerce products and doesn work with metafiled, + has very simple options. MDTF – can filter all post types, and works with meta fileds, has its own meta constructor with different logic features. WOOF created for that who want quickly create simple woocommerce filters quickly, and not needs smth extra – only filtering by categories,attributes,custom taxonomies, price. Hi, Does this price range filter, work with your WooCommerce Currency Switcher plugin? Hello Dan. Good question, thanks! Just did it with 2.0.7.2 : http://www.demo.woocommerce-filter.com/ – but remember please – this plugin is only for woocommerce! Good day, i have a pre-buing question. im testing your free version on word press, and it seems thet it does not support cyrillic letters in attributes, right? A really good plugin that simplifies your woocommerce-day really. I tested the retail version of the plugin for some time and have an active communication with the developers. They really go at each point which I produce and put it directly to things, so will the plugin steadily better and the contact with the customer is simply and very nice. Any ideas on why it isn’t working? I am trying this out and it mostly works well. But when I set Show Count to No it doesn’t display anything – no categories, only the filter button. Is that the way it’s meant to work? I want to hide the number of products next to the categories, not the categories themselves. It’s OK, the client doesn’t mind the number showing afterall. Is it possible to filter by price on variable products so that the filter will show only the one price and not the range of prices? Could you please help me out with the color filter? It does not seem to work. We’re using the color attribute, but it only seems to work while the checkbox/radio is used. Hi, i’m about to buy this plugin, but i need to make sure it does what i need. Here is my questions: 1) I need to display about 30-40 different tag filters, When i used free demo, list of tags was showing only 21 of them. can i change the limit of number of tags displayed in filters? 2) Is it possible to create value range filter for anything else than price? I need it specifically for tags. When i browse a parent category, the category filter display only the children category, but when i browsing a child category, All the category get displayed. I have a 3 level taxonomy and the Relevant Terms filtering seem to work only on parent item. The fix you wrote worked perfectly. Only problem i’m facing now is when I’m activating the Dynamic recount, all I get is 0 on all attribute. Nope wasn’t working on previous version. Look like the plugin just don’t query the database. and I have a problem -> is it possible to set up this filter that If I select “Angli?tina” and “Praha” (English and Prague) that I will see only, English in Prague, but not all other language packages from Prague like it’s now? Why dosent it show my products in the form, I have both cats and tags but it shows nothing?? Is it compatible with WooCommerce Brands . Filtering Price , Brands added through this plugin , Product category . ? Hello , Just now purchased , working fine , including woocommerce brands . Search by product is not working . How can i enable this ? Also filter by price is working by entering price only . Please help me . price filter – is native of woocommerce plugin, what exactly wrong with it? Sent you the mail about price filter issue . Hello. I see no PM from you. I bought this plugin a few days ago after trying (and buying) several other one’s. This plug-in works perfectly and I and my client are very happy with. I needed two times support, the response came within two hours. The plugin is great and the support even better. I can really recommend this plugin. Hi. Pre purchase question. I can see using the free version that is compatible with Ultimate Brands. I’m using free Ultimate Brands as well. I would like to know if on both pro versions on the filter will appear the brand logo. I am interested in purchasing because I want to filter by tag. however, if I select one tag, I want to then be able to filter by a second tag. so if there is a group of products with tag1 and this is selected, it will display only tag1 products. Then if I select ‘tag2’ in addition, it will show only those products that have both tag1 and tag2. I would like to change the color of the price filter slider to something other than purple. Would you please tell me where to change the css and provide a quick example of what the css code needs to look like? I have tried modifying it in a couple of places, but it doesn’t seem to be working. Hello. There is using native woocommerce price range slider, and you can overload its css classes, so I did it a little here: wp-content\plugins\woocommerce-products-filter\css\front.css http://clip2net.com/s/3jEn5Dv – so you are need manipulate with css classes you can see on the screen. For this you are need to be experienced with CSS. I apologize. I was away most of yesterday. I just sent you the FTP info you requested to your email. I also attached two (2) screenshots concerning a graphical issue I found. I also attached two (2) screenshots concerning the “woof_is_mobile” function..
Glad to see your sales rising. How are things going with “Update 18” to the support question ? And can you please email me the updated version? But the purple button should be hidden for “desktop” devices. It should not be hidden for .mobile”. “Search by Title” works fine. “Search by Title or Content” does NOT work. How are things going with “Update 19” to the support question ? Thanks for resolving ALL my requests or issues. FANTASTIC plugin. Way easier to use than “MDTF” . Please check your email for “Update 20”. As I have some question as to HOW you resolved my inquiries. 1) – I am not certain if you made changes to the plugin – OR - if you made changes to the theme. 2) – Please email me an update to the plugin IF there is one. Along with what version it currently is . Planning to buy as many licenses of this plugin as I am able for future projects. You said you added a script to the “footer.php”. 1) – Where exactly should I navigate too see it ? 2) – What does the exact code look like that you used ? 3) – What is the current version of the plugin ? 3) 2.1.0 – you have the latest ….